Engage in important industry research topics. Topics for this year’s symposium include: Heterogeneous Integration, Electronic Materials, Thermal Challenges, 2.5D & 3D Packaging, Power Electronics, Flexible & Additive Electronics, Sensors & Embedded Electronics, Automotive & Harsh Environments, Photonics & MEMS and Materials for Energy Storage. 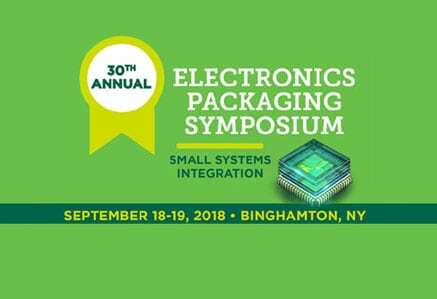 The 30th annual Binghamton University and GE Electronics Packaging Symposium is the premier electronics manufacturing conference in the Northeast. The conference features more than 50 invited technical presentations by academic, industry, and government leaders, influencers, and decision makers. The program includes an IEEE Electronics Packaging Society-sponsored workshop on Heterogeneous Integration, student poster session, lab tours, and exhibits.